w.w.e.d.? : the take on takeout. i called in a takeout order the other day from chili's. i've done it before. no big deal. when i picked up my order the hostess was helpful, perhaps a little more than usual. she deliberately went over my order: a salad with almost everything on the side, extra pico, and she made sure that i knew she had included plastic utensils. great. here's my card. where do i sign? after scribbling my sig on the receipt, she examined the document and told me to "please fill out the other two lines." uh, what? confused, i took the receipt back and tried to make sense of her request. the "other two lines:" tip and total. i'd never been asked to do this before on a takeout order. was this a tip solicitation?? for giving my order to the kitchen and throwing a plastic fork in the bag? she didn't grind fresh pepper on my meal or top off my water. doubting her actions warranted monetary reward, i still left the tip line blank and just copied the dollar amount from the subtotal to the total. suddenly feeling a little embarrassed, i'm not sure why, i just grabbed my order and quickly exited before i could see her reaction. once back in my car, i really started to question whether or not i did the right thing. did i just stiff her? was she mad at me? would she recognize me next time and spit in my food? am i supposed to tip on takeout and have been wrong all my 26 years of living? i don't tip the drive-up window attendants at wendy's; is there that much of a difference?? i consider myself relatively savvy when it comes to social situations, and my lack of confidence in they way i handled the situation has been gnawing at me. i don't want to be a jerk, but i'm still pretty sure i made the right decision, and i'm glad her jedi mind tricks didn't coerce me into doing something i didn't think needed to be done. so friends, especially those with extensive food service backgrounds, what should erin do? ha! that's a funny story! i don't have any food service experience, but it sounds like you did the right thing to me. you shouldn't be ashamed. i'm gonna ask lexi, she works in the take out of chili's. i'll let ya know! haha! that is a pretty funny story, i wish i could've been there! don't be ashamed, i think you did the right thing. then again, i don't have any food service experience... i'm gonna ask lexi, she works in chili's take out. i'll let ya know! that is funny. i totally would have done the same. in fact, that happened to me the other day somewhere else and i thought "do i really need to tip this person? they really didn't do anything for me." i felt so horrible crossing out the tip line and handing the slip back to her. i agree with you and lori's googled research. no tipping on take out! Wow....first of all, she should have never asked you to fill out the other two lines (that should negate a tip all together). I was always told if I fought a tip (or lack thereof) I would be fired on the spot. Plus, she was probably the hostess and got paid a decent hourly wage, where the servers/waiters probably get paid less and depend on the tips, thus a tip for her was not needed. interesting scenario. i would have done the exact same thing. i'm growing increasing tired of tip seekers, especially when one isn't deserved. and in this instance, it was not deserved. there's nothing worse than that awkward moment when you scribble a big, black horizontal line through the tip line whilst the one you could be tipping, watches. the mere fact they even put me in such a position should void the tip altogether. i think a delivery service and a sit down meal when one is eagerly striving to make my dining experience enjoyable are about the only "food service" times a tip is necessary. i'm so proud of you for holding your ground and not giving into the pressure. you make me proud. Hey, I was just at Chili's today picking up my to-go order! I just always thought that you tipped, so I did. The girl was VERY excited, so it made me feel good. But, back to my days of being a hostess at ZCMI Tiffin Room, I put together to go orders and I never got tipped. It's good to tip your server because they are only getting like $2/hour, where the person putting together your to go order is a hostess and they are getting the $6-7/hour. No Worries friend, your pregnant hormones are just kicking in. Being Prego makes you a little crazy!! Not that you are crazy, your hormones are.....you know what I mean!!!!! 1. It is wise to always fill in the total amount (and tip--even with a hyphen representing a zero) on your credit card receipt to prevent the vendor-employee from writing in a tip for themselves. Apparently this is a growing problem these days, so credit card companies suggest you complete the bottom line to assure the charge doesn't "grow" after you leave. 2. If the order is large and/or complex, as Lori suggested, a tip might be in order. That's very unlikely for a simple salad, in my opinion. I am SO GLAD you brought this subject to open conversation. This scenario has been troubling me for years. I waitressed for 4 years, BUT I rarely helped customers on take-out. When I did, I never expected a tip...I hoped for it but NEVER expected it. Other waitresses, hostesses and bartenders DID expect it though. Jeremey and I are constantly doing take-out instead of dining-in for the main reason that we don't want to tip a waitress. Yet, when I get take-out, I still somehow feel guilty when I don't leave them a few dollars, but they really don't do anything!! I am so glad that I have the support of you and all your blogger's because now when I leave the tip area blank, I think I will walk a little more casually out of the restaurant instead of speed walking out with my head hanging low. all my experience is in the picking up - if I do the work to come get it - no tip for you. It is good that she had you fill in the lines with $0 and total it - some restaurants have gotten in trouble when the servers have gone back into receipts and added healthy tips..... hmmmm. I tried calling a local pasta place for take out order (which they advertise)- no answer. I then drive over and order #16 and #33 on the menu TO GO with no variation or options (i.e. little dialogue for order and no small talk). I pay with CC and blank out the tip space and enter total, same as subtotal. I then check my credit card statement online that evening, and it looks like they have filled in what amounts to 15% tip. Is that credit card fraud? Is that allowed? I'm usually a good tipper, but I think a tip is not appropriate htere. My personal belief is that although the waitress may have taken time to bag up the goods, I consider the high price of dine-in restaurant meals to include the realestate, waitress service from orders, making suggestions, small talk, refilling glasses, fixing errors in food preparation, to totaling bill, and even cleaning afterwards including dishwashing and bussing. 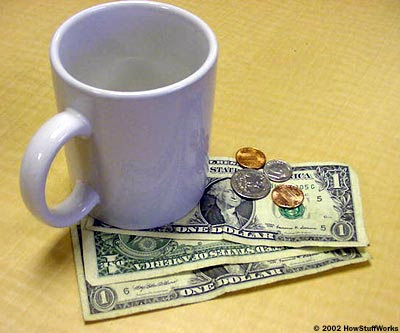 My belief is that the restaurant saves considerable money when a person orders TO GO (please provide feedback on this belief), so they should either pass those savings to the customer, or transfer them to the waitress in lieu of the customer tip. I think there should be absolutely no requirement to tip on to-go orders.